Chimney Rock Pioneer Crossing is a relatively new campground located on the road to Chimney Rock (Highway 92 & County Road 75) about three miles south of Bayard. 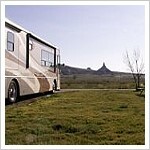 The park is in a rural setting with breathtaking views of Chimney rock, a famous landmark on the historic Oregon Trail. Lunch and lite snacks are available here and the even have trout in the pond. They have pull through campsites, teepee rentals, and tent camping. The restrooms and facilities are clean and well maintained. The staff was very friendly to us when we visited. Don’t forget to stop by the Settler’s Trading Post… they have very nice gifts including hand-made pottery wind chimes.